A recent eBay purchase of some Colorado records put me in contact with a most generous seller, who loaded me up with some great state vinyl. In the box was a 7" 78rpm red vinyl children's recording, Daddy Ed's Original "Sammy the Skunk" / "Dummy the Duck," on Band Box. The record did not carry the familiar Band Box logo, and in all of the history I read on the label, there had been no mention of a children's recording. The story of Band Box goes that, in 1957, Romanian immigrant Aurelia Vicky Morosan (1909-2006) saw a newspaper ad for a studio for sale - Columbine Records. She bought the company, and called it Band Box (after Columbia Records pitched a fit about the similarity of the names). 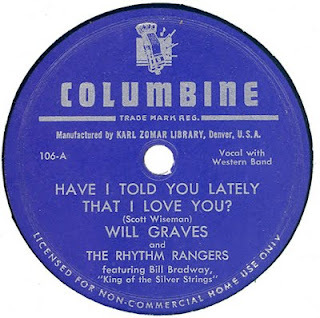 The label churned out about 200 singles (and a few LPs) in the late 1950s through the 1960s, including from Orlie & the Saints, Lee Chandler & the Blue Rhythms, Jimmy DeKnight, and Freddie & the Hitch-Hikers. With that knowledge in hand, I set out to find whether or not this Daddy Ed record was, in fact, on the same Band Box label as the one Vicky Morosan owned. A search through Billboard magazine's 1957 archives found an advertisement for a studio for sale, in Lakewood Colorado. Viola! Could this have been the ad Vicky Morosan saw when she bought Band Box? Wait up... this ad (dated 1957) says a label called Band Box, not Columbine, was for sale. The year is right, according to the archivists, but not the name. 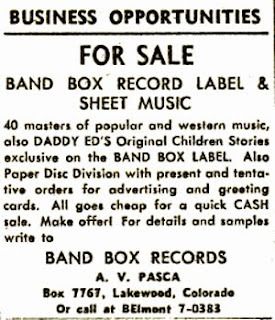 The ad mentions that the buyer will receive, among the other holdings, Daddy Ed's Original Children's Stories. So I was able to confirm what I had was a Band Box record, but were there two Band Box labels in Denver? The actual record information on this Band Box label is pretty sparse, minus a very lengthy patent number. After spending several hours on the phone with the U.S. Patent Office, in Washington D.C., I found that the number, "671-182-617-863," doesn't relate to anything in its files. Swell. Next stop was my Complete Guide to Vintage Children's Records Identification and Price Guide (Peter Muldavin 2007). Nada. Not one single reference to any Band Box children's recording. "I have never heard of it before," Muldavin told me, when I contacted him. "It's probably a local record issue, perhaps by a local radio or TV children's show personality. There were literally hundreds of these types of shows in the late 40's through the 60's. Many made their own records." So I set out to find the contact person in the advertsement - "A.V. Pasca" in Lakewood. But calls to every single Pasca residence in Colorado resulted in another dead end. I'm not one to give up, so I did some more searching. On a hunch (and some additional digging) I was able to find that Karl Zomar owned the Denver-based Columbine record label at least until 1954. There was no record of him owning it after 1954. Lo and behold, after some additional phone calls to the U.S. Patent and Trademark Office in Washington, D.C., I found out that the name "Band Box Records" was registered in 1954, by, guess who? Aurelia Vicky Morosan - three years earlier than all of the history on the label had proclaimed. 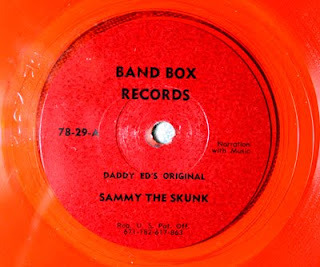 So if Vicky bought Columbine from Karl Zomar, in 1954, and had the dust-up with Columbia over the name, and then changed it to Band Box, the Daddy Ed record would have to be dated sometime after 1954. Furthermore, the familiar Band Box logo was officially trademarked in January, 1962, at least according to the patent documents. So if Vicky owned Band Box in 1954, who is "A.V. 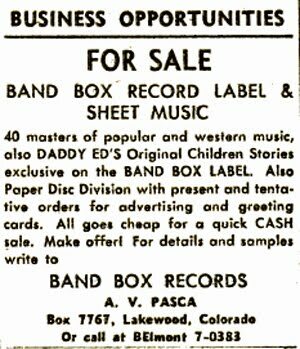 Pasca," and what's with the 1957 advertisement posting a Band Box label for sale in Billboard? I have to admit, that one had me too, until it dawned on me - could the "A.V." stand for Aurelia Vicky? When Vicky's parents, Elena and Demeter migrated from Romania, in 1913, their last name was Pasca (the family later changed the spelling to Paskie). In 1957, after apparently owning the label for three years, she decided to sell it. Hence the ad in Billboard. Thankfully she didn't have any takers, and groups such as Orlie and the Saints, Bill Goodwin, the Four Chevelles, Warren Robbe, and numerous others were able to put their songs on vinyl for all the world to hear. In 1971 she tried to sell the label again. Which left me just one piece of the puzzle to find. Who is Daddy Ed, the narrator of the two stories on the record? For that answer I enlisted the help of 1950s era Denver disc jockeys, who seemed to think that it's Ed Scott, who was doing Denver radio around this time, before he moved over to television, and interestingly enough, starred in a long-running children's program as "Sheriff Scotty" on KLZ-TV (later KMGH-TV). Unfortunately, it's not Ed Scott. "I did record records at Band Box, but I'm not Daddy Ed," he told me. "I did record four songs there at the Band Box studios, but they were for the Moppet children's label. I recorded them with a trio of guys, including Art Gallo (sp?). We recorded "The Rocking Horse Rodeo," "Wonderful Land of New," "Wonderful Land of New, Part Two," and "If You Never Make An Enemy You Never Lose a Friend."